New smithy trying it out in Michigan - The Iron Forge Fire Blackmithing Forum. Hi, Im Jacob. I have had long time passion for making things and metal work since working in artist classes in college. At times I have found myself with spaces to work and not. Right now I am getting close and working on using a shed for a hot/ powerless shop and then using mobile and tuck away power equipment from a garage. This was my first completed knife, it was really more of an art piece than functional though. I want to make things like this. 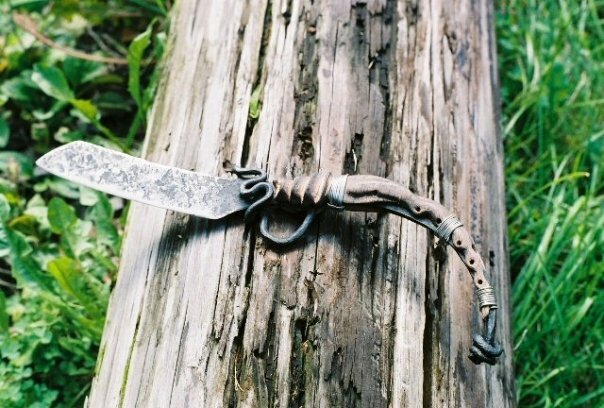 Not intending to be a blade smith but I know I will make a few for sure. 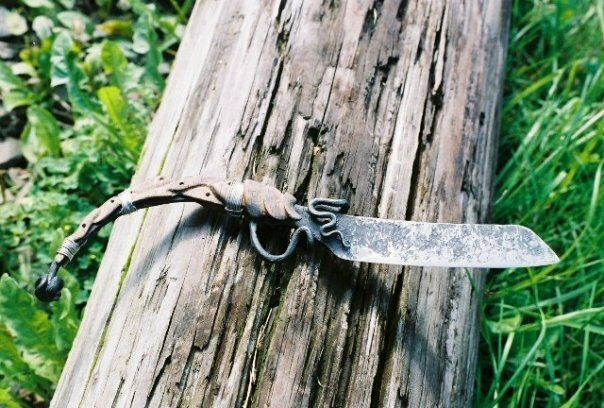 originally forged from a piece of coil spring, i split it, and drew out a long tendril for the guard, which eventually broke off as I was then drawing out the tang and pommel "knot" the guard was then welded back and using a torch was bent. Then heat treated and mildly finished. the handle was kind of weak though as it was dremeled out of a solid piece but needed better structural bonding to the body. A lot of forge work goes into that. Good job!